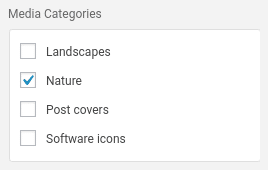 One of the most annoying problems affecting WordPress is undoubtedly the lack of a native way to organize the media library in folders. For those who have never uploaded many images or multimedia files on their website, this is not so bad. But for all the others… it’s a real pain! That’s why today I’ll show you the two best plugins to organize your media library: WP Media Folder (paid) and Enhanced Media Library (free). WP Media Folder is the best plugin for organizing the WordPress media library. As you can already guess from the image above, the interface is simple and intuitive, recalling the usual organization of folders within a PC file manager. In particular, the ability to select multiple files simultaneously and move them from one folder to another makes the organization of the media library extremely easy and fast, even for less experienced users. The price of the plugin is $29, quite a bargain if you consider that a single license permits usage on an unlimited number of sites. The plugin does also include support for multiple languages. But hurry up! The coupon is valid for a limited time. We must admit it: despite being the best free alternative to WP Media Folder (as well as the most downloaded free plugin of its type), it doesn’t stand the comparison with it. Sadly, Enhanced Media Library does not allow you to create a graphically recognizable folder structure, but only to assign a media category to each file. By doing so, you can later view the contents of a particular media category with the appropriate filter in the library. Moreover, Enhanced Media Library does not allow you to upload media files directly within a category or to select multiple file to transfer them simultaneously from one category to another. Summing up, despite being the best free plugin available, it only provides basic functionality for organizing the media gallery. However, it is still recommended to those who are content and prefer to save some bucks. For sake of completeness, we must mention a third plugin to organize files and images in folders, called WordPress Real Media Library. This is a paid plugin for sale on CodeCanyon at $24. It is an extremely basic plugin, whose functionality is limited to creating and managing folders in the media library. If it was a free plugin, we would not hesitate to recommend using it. However, the small price difference compared to WP Media Folder (5 dollars) makes it not a big deal, since the latter offers a lot of extra functionality. In any case, on this page you can request a free trial of the plugin directly online. I don't mind paying $29 for WP Media Folder if it is the best. But their policy is to only provide free updates for 6 months. I don't want to have to re-buy it every 6 months because features stop working with the latest WP versions.